SolarCal D is the newest Coral Calcium Mineral Supplement in the Robert Barefoot product family. Solarcal-D is a highly effective combination of Marine Coral Calcium with essential Vitamin D3 added for optimal absorption. Robert Barefoot is a respected chemist, author and nutritionist whose life mission is to teach America how to combat many of the degenerative diseases that plague America today. Many of these diseases can be traced directly to mineral deficiencies in most diets. Robert Barefoot's years of research and development have culminated in the development of an elite line of health supplement products. 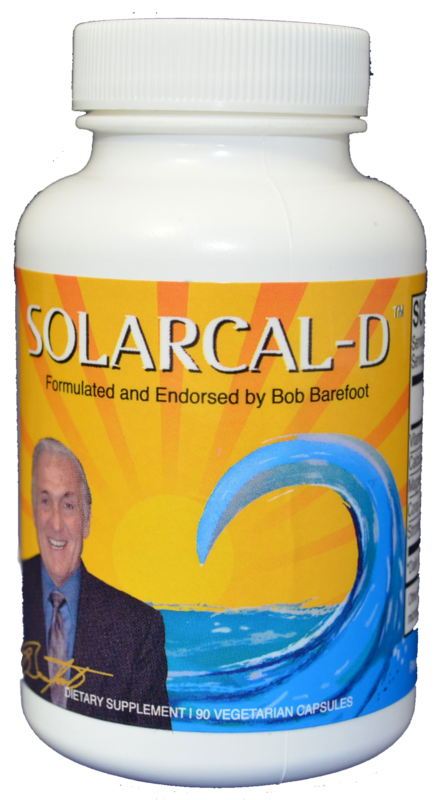 Barefoot's formula for Solarcal D is a combination of nutrients that are indispensable for a healthy body. The combination of Calcium and Vitamin D in Solarcal D are formulated to improve the body's power to create and retain alkalinity, oxygenation and optimal mineral stores. Regular use of this powerful supplement may reduce the risk of osteoporosis, colorectal cancer and hypertension. Solarcal D may also aid in the maintenance of a healthy immune function. Until you have personally tried one of Bob's Health Supplement Products, you won't realize or understand the positive effect that the supplementation of your diet with essential minerals can have on your overall health and well being. Each bottle contains 90 capsules: A one month supply. A single 3 capsule serving of SolarCal-D contains 1500 mg of the highest grade Okinawa marine coral calcium and 50 mcg (2000 iu) of Natural Vitamin D3 in the proper balance to ensure optimal absorption. SolarCal D is recommended for all people who want the simplicity of a Mineral Vitamin Supplement with Vitamin D3 only with no additional vitamins or nutrients. SolarCal D does not have the other high grade ingredients that are included in the Coral Calcium supreme or Bobs Best 2000.